A nonprofit (church-affiliated) facility in Hyattsville, Sacred Heart Home maintains 102 certified beds. It provides both short-term and long-term care, although it stresses the latter, terming itself "an intermediate long-term care residence." Residents' own doctors supervise care. This facility also offers "social services," "activity professionals," a registered dietitian, and spiritual counseling. Sacred Heart Home is openly and avowedly on a religious mission, operating under the slogan, "Ministry of Sisters Servants of Mary Immaculate." This facility is not without flaws, and it would hardly be a surprise if a nursing home lawsuit against this facility. But if you dig into this nursing home and the Medicare ratings, this nursing home is doing fairly well. Crescent Cities Center: This Riverdale nursing home is the only one within two miles of Sacred Heart that beats the latter in any Medicare rating category: Crescent Cities gets four stars for staffing, versus Sacred Heart's three stars. Otherwise, Sacred Heart comes out on top (5 stars to 4 stars, overall). ManorCare Health Services - Hyattsville: Here's another very strong performer that just happens to sit about a mile from Sacred Heart, which is an even stronger one. These two highly rated facilities are mostly comparable, though Sacred Heart gets overall five stars from Medicare, versus this Hyattsville ManorCare facility's four stars. St. Thomas More Medical Complex: The last time we checked the current Medicare survey, it still listed this facility by that name, although the name has changed to NMS Healthcare - Hyattsville (where it's located). Whatever it's called, this facility was another close runner-up to Sacred Heart in terms of the main Medicare ratings. ManorCare Health Services - Adelphi: Limping in a distant fifth in this race of five local nursing homes, this Adelphi facility couldn't compete with the others at all if it had not somehow attained a 5-star rating for quality measures (a very important Medicare category). All five of these neighbor facilities got that 5-star rating, but this particular facility was at the back of the pack with its overall 2-star Medicare rating. Sacred Heart's most recent health inspection, in June 2016, turned up only five deficiencies - better than the 7.2-deficiency national average and well ahead of the 11.5-deficiency Maryland average. This performance earned Sacred Heart a 4-star rating (above average) from Medicare. Medicare gave Sacred Heart a 3-star (average) rating for nurse staffing, despite the fact that this facility came up much short of the state and averages in terms of daily nursing time per resident. Total nursing time per day here, at 1 hour, 12 minutes, was significantly below the Maryland and U.S. averages (1 hour, 51 minutes for Maryland; 1 hour, 41 minutes nationally). Sacred Heart was sharply lower in giving residents time with registered nurses: a mere 22 minutes per day (state average: 58 minutes; U.S. average, 50 minutes). The RN rating for this facility was two stars (below average). In terms of nursing time, Sacred Heart was by far most generous with its CMAs (certified nursing assistants), exceeding the state and U.S. averages by about 45 minutes per day. But it gave residents no daily time at all with physical therapists. These figures suggest that the 3-star rating should have been two stars. What's more puzzling is that the relatively meager amount of nursing time would seem to contradict this facility's stated purpose of "mercy, in the form of caring for the aged… with love, understanding, and compassion…. Our nurses are available to deliver passionate, loving care around the clock…." Medicare collects stats on the types and amounts of care residents receive, which it collectively terms quality measures. Medicare assembles the stat separately for short-stay and long-stay residents. Perhaps in keeping with its status as an "intermediate long-term care residence," Sacred Heart appears to have very few short-term residents; at least, there were no data available for five of the nine categories applicable to short-stayers. The stats Medicare did obtain were exceptionally odd: zero percent of these residents reported having serious pain (which is terrific), but 35.7 percent of them had problems with pressure ulcers, or bed sores (which is horrific: the state and U.S. averages, by contrast, are 1.3 and 1.2 percent). It seems clear, then, that Sacred Heart's 5-star rating for quality measures was due to its stats applicable to long-stay residents. This facility had better - or much better -- stats than the Maryland and U.S. averages in 13 out of 15 measured categories. Again, the number of residents reporting serious pain was zero - but this time the figure probably applies to far more of this facility's residents. (Sacred Heart's total of 98 residents was about average.) The rate of depression among long-term residents here was an almost negligible 0.3 percent; the Maryland average was over 15 times higher. Sacred Heart was only about half as likely as the state and U.S. nursing home averages to dispense antianxiety or antipsychotic meds (which Medicare considers a good point). Everyone got flu and pneumonia vaccinations. No one was subjected to ongoing catheterization or physical restraints. The number of residents who needed help with daily activities was about half that of the state and U.S. averages. The urinary tract infection rate here was lower than average, and, significantly, so was the rate of pressure ulcers - again suggesting that the pressure ulcer statistic for short-stay residents was anomalous. 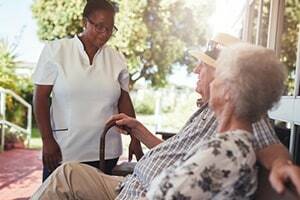 Our law firm handles nursing home cases on behalf of victims in Prince George's County and throughout Maryland. Have you or someone you love been mistreated or received substandard care in a nursing home? We can help you. Call us today to discuss your options at 800-553-8082 or contact us online. Get an inside look at every Maryland nursing home. Do good nursing homes like this one get sued? Absolutely. But, more often than not, it is the worst nursing homes that make up the lion's share of the claims. Call Miller Zois' nursing home attorneys today at 1.800.553.8082 or get a FREE, online case evaluation.